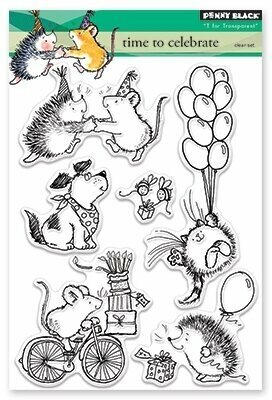 Penny Black clear stamps featuring cats, dogs, mice, and hedgehogs. Kitten power activate! Super Cat is the perfect complement to Super Dog - a merger of powerful pets ready to save the day with their extraordinary skills and talents. Like their canine companions, this quartet features comic-book inspired accessory images and words as well as a collection of sentiments that will mix and match effortlessly between the two sets. Clear stamp sets include the name of the set on the sticker for easy identification. New critters to mix and match with your collection! Set of 5. Features sleeping fox, kitty, bunny, puppy, and deer. Christmas Penny Black clear stamp featuring dogs and cats having fun! 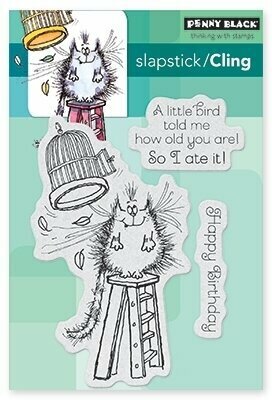 Penny Black clear stamps featuring a cat with the birthday sentiments "Happy Bird-Day", and "To a very special you". A cheerful cat shows his fangs in his smile. Image measures approximately 2-3/4" X 2-3/4". This original design by Fran Seiford is deeply etched and precision cut from premium gray rubber on a 1/8" gray rubber foam backing then mounted on a cling vinyl decal with full sized image for easier storage and use with an acrylic handle sold separately. Made in the USA. 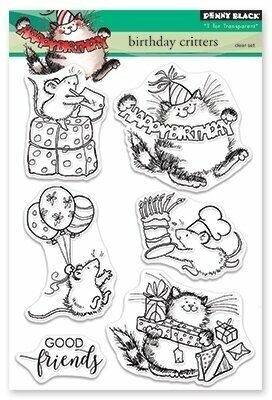 Christmas themed Penny Black clear stamps featuring mice decorating a Christmas tree, cats hanging stockings, and more! 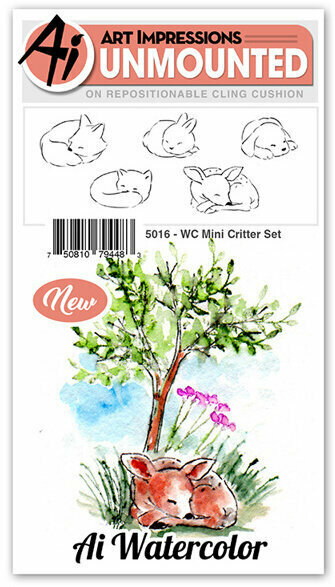 Cat themed clear stamps from Picket Fence Studios featuring the sentiment "I Love Cats". Unique, beautiful and creative stamps designed by Nicole Petersen. Use with paints and inks. Perfect for card making, journaling, scrapbooking, and mixed media. 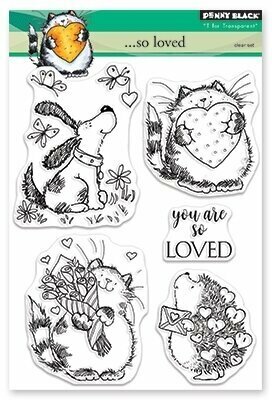 Cat themed clear stamps from Picket Fence Studios featuring a collection of cats and the sentiments "I hope you are feline better soon", "I only purr for you", and more. Unique, beautiful and creative stamps designed by Nicole Petersen. Use with paints and inks. Perfect for card making, journaling, scrapbooking, and mixed media. 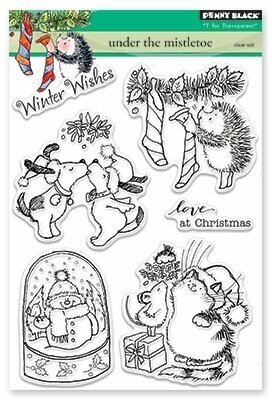 Christmas themed Penny Black clear stamps featuring dogs kissing, a hedgehog hanging stockings, and more Christmas scenes. Cling stamp from Carabelle Studio featuring a cat and kittens. Penny Black clear stamp featuring cats, mice, and "Happy Birthday". 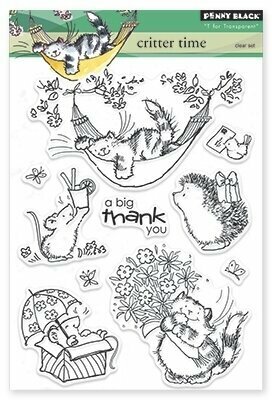 Penny Black clear stamps featuring mice, cats, a hedgehog, and "A Big Thank You". Cat lady or not, you kneadthis fabulous foursome of felines. These sweet and spunky furballs are each in a different position allowing you to create scenes that showcase them happily interacting. Four punny sentiments are also included to create cards suitable for a variety of occasions. This 8 piece set includes: Fat cat 1 1/4" x 1 1/2", Sleeping cat 1 3/4" x 7/8", Large sitting cat 1" x 1 11/16", Small sitting cat 1 1/8" x 1 1/2", Thank You for Being There When I Knead You 2 9/16" x 3/8", Together, We're Purrfect 2 3/8" x 3/16", Happy Purr-thday 1 3/4" x 3/16", You're All I Knead 1 5/8" x 1/8". Clear stamp sets include the name of the set on the sticker for easy identification. Our clear stamps and Die-namics are made in the USA. 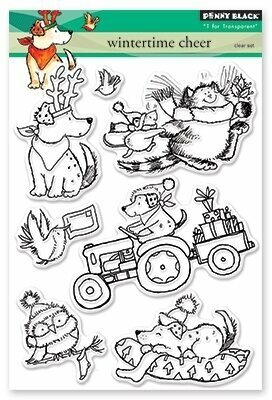 The dogs, cats and sentiments in this 4" x 6" clear stamp set are doggone purr-fect! Coordinates with our D-15-13 Furry Friends Elle-ments Die Set. Illustrated by Heather Campbell. Tall Cat measures : 1" x 1 7/8", Largest Dog measures: 1 1/4" x 1 7/8", Purr-fect measures: 1 1/4" x 1/4". Made in the USA. Cat ladies, rejoice - this set is for you. Three different pairs of cats can be used individually, or invite other cat pairs to the party for a meow-velous time. Add tiny scene enhancers like flowers, hearts, and cat-favorite mice and birds for a truly terrific time. 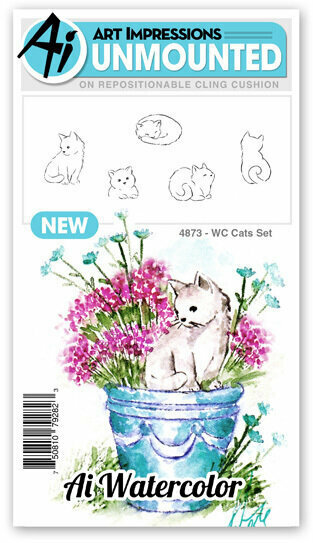 This 17 piece set includes: Cats (6) 1 1/4" x 7/8", 1" x 1", 3/4" x 1", 3/4" x 1", 3/4" x 1 1/8", 3/4" x 7/8", Flowers (3) 3/8" x 3/8", 3/16" x 5/16", 3/16" x 5/16", Bird 7/8" x 1/4", Mouse 1/4" x 1/4", Hearts trio 3/8" x 3/8", Sentiments (5) ranging from 1" (Mew Did It) to 3 1/8" (Happy Birthday to One Cool Cat) in length. Clear stamp sets include the name of the set on the sticker for easy identification. Our clear stamps and Die-namics are made in the USA. These rubber stamps feature a hardwood base with an indexed edge to make the stamp easier to hold and a precisely cut deeply etched rubber design layer that will leave clear, crisp, highly detailed images on most surfaces. This package contains Nerdy Cat: one red rubber stamp mounted on one 3x3 inch block. 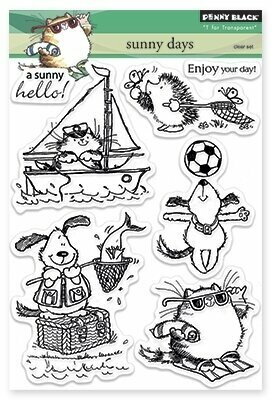 Clear stamps from Brutus Monroe featuring sentiments for cat and dog owners, including "Dogs have owners, cats have staff", "You are a rock star", "Be unique", and more. 2 Clear Stamps on a 2x2.5 inch storage sheet. 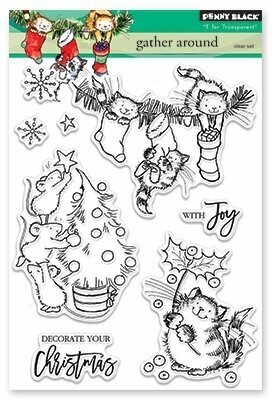 Features a cat, and the phrases "Sassy", "Cat-i-tude", and "purrfect..."
Impression Obsession cling stamp featuring a cat inside a Christmas stocking. Impression Obsession cling stamp featuring a Tiara. 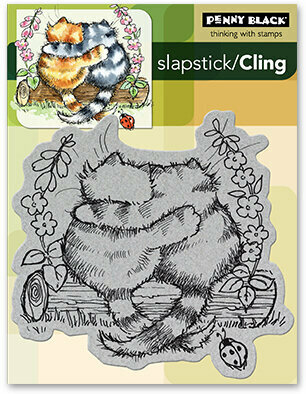 Love themed Penny Black Slapstick cling stamp featuring a pair of cats. 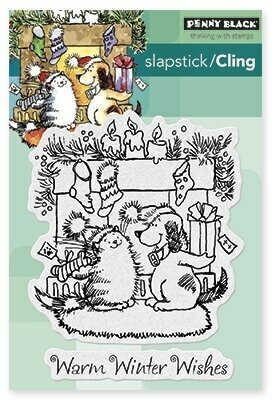 Christmas themed Penny Black Slapstick cling stamp featuring a cat, a dog, and a fireplace. Five cats in different poses, such as sitting, curled up, and peeking as though in a container. Numerous possibilities ***Colored image on the packaging is for inspiration and may use stamps from other sets. The stamps included are the black images. 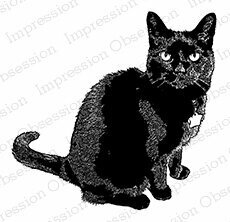 Impression Obsession cling stamp featuring a cat with arched back.